it’s oddly odd that my Mom would think I’m an aging woman with helmet hair. but then, my mom has severe dementia. the plant in the corner has better days. maybe a holiwoo montage is looping endlessly in her head with chic me getting frustrated ripping my writing from the mechanical letter press then crumpling it into a ball. and don’t me get started on that typewriter because it’s reached fetish proportion as an on screen tool that I can’t do without. you know how the E sounds just so when it smacks the roller? I cannot write without hearing that sound. clickety-click-clack. the reality of writing is that it’s as much non-writing as it is typing. the brain is an amazing thing. it will work for you when you aren’t. it’s why you can sit in front of a keyboard and type type when it’s time to do that. meaning drinking beer and watching the game IS writing. sadly, there is a limit to the amount of time you can “work” away from where you work. remember, the words aren’t going to get on paper by themselves. they will try despite you. don’t squander a season of games on one job. I’d do her. everyone has to have a muse even if it’s a fantasy. sometimes a fantasy is all you need. it’s less demanding compared to the real thing. unfortunately mental masturbation eventually becomes pointless or boring. so you’ll switch to real with the idea that writing for somebody is a lot easier than doing it for something you made up in your head. your writing muse doesn’t have to be your significant other. your editor could be your muse. or a fan of you show, blog, book, column… just um, look the real thing comes with consequences so consider that before signing one to your side. consequences? remember that if beer and baseball is part of it and when she doesn’t then you won’t and then nothing will get written. sigh. the thing about writers block is there is no such thing. there are four rules about writing. the first rule of writing is to write. write anything. get it on paper. in your computer. or in a notebook. the what doesn’t matter so much as the act. which bring up the second rule: write every day. it’s important that you have the ability to command words on demand. think of it as running or lifting or any other physical training. over time you get better. it stops hurting as much. and you actually like it. third: words are better than no words. no matter how you “feel” get over that. some people have this ritual where every thing must be just so. the coffee, the light, some music, a light breeze and not feeling over full from lunch. if one single thing is out of balance none of it works and no words are put. stop that. make the words. forth and last is finish. want to feel surreal? go to a book store, pick up what you wrote and look around. yep, that’s you surrounded by a bunch of other writers that are doing what you did. every time I sell an article I did that. and once in a while I get a check from my book publisher for something I wrote. it never gets old. if I had one other thing to say it’s “stop making it some day.” see 1.
want to do… hell this is WHAT I do! there are no excuses. it is always a good time for writing. and sometimes I forget to eat or pee or talk to her. 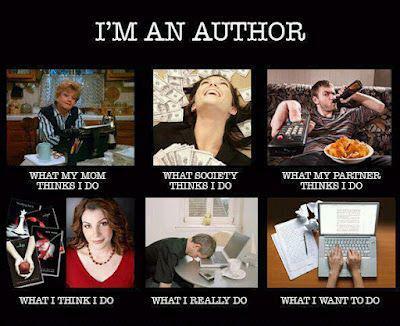 being a writer is all that. there are days when the words end up there all on their own. once in a while they get forced. how they got there doesn’t matter because they got there. disclosure: I like old typewriters but I don’t own one. I have a favorite keyboard. it’s not the one you think it is. I like printing as a proof reading platform even if the words are going elsewhere. my werp tool can be any tool like Word, TextEdit or even Mail. as long as there is a speel checker I’m happy. I’m not a “distraction free” believer and I will make fun of you if you are.